As the final release of his storied tenure on iconic New York rap label Fresh/Sleeping Bag Records, Just-Ice's Masterpiece brings the rapper full-circle with an album that lives up to its title. Having shocked the hip-hop world with the release of his landmark debut Back to the Old Schoolin 1986, the Bronx-based rapper shot to fame with an aggressive, tough-talking style and high-profile co-signs from KRS-One, Chuck D and Kurtis Mantronik, among others. 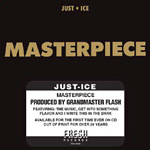 By 1990, Just-Ice was a veteran of the rap game, having survived clashes with the police and fellow rappers (Run-DMC), and he poured all of his experiences into Masterpiece. With production duties handled exclusively by the legendary Grandmaster Flash, Just-Ice crafts an album that brings his brash style and rugged street stories to life with flawless precision. Now, for the first time ever on CD, Just-Ice's Masterpiece is presented with a new, high-quality digital transfer from the original analog tapes, packaged in a digipak based on the original LP sleeve design.